I’m delighted to welcome Helen Moss onto the blog today. Helen has written numerous children’s books including the Adventure Island series. 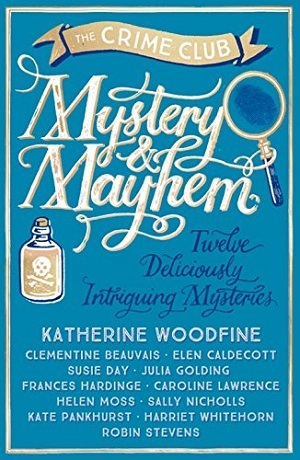 Her latest story is published in the Mystery and Mayhem anthology – a wonderful collection of short mysteries from some of today’s best children’s writers. The book splits the stories into types of mysteries – closed system crimes, and canine capers as well as impossible mysteries – but Helen’s fits into the poison plots section. The beauty of the collection – as well as gathering such a huge pool of talent – is that readers can crack the mysteries as they read the stories. The stories are also a delicious taster to the world of these particular authors – I heartily recommend it. Today, Helen reveals the inspiration behind her story – The Mystery of the Pineapple Plot. One of the most exciting things about being invited to contribute to the Mystery and Mayhem anthology was the chance to write a story set in the past. My Adventure Island series takes place in contemporary Cornwall, and even though the Secrets of the Tombs series has an archaeological theme, the action all unfolds in the twenty- first century. The Mystery of the Pineapple Plot was my first foray into a full-on history mystery. I knew straight away that I wanted to set my story in the eighteenth century because it’s full of larger than life characters, new discoveries and amazing events. It’s a favourite period for romantic novels and historical dramas, but it’s not all that familiar to younger readers (it tends to get rather skipped over as the-bit-between-the-Tudors-and-the-Victorians in school history). But it wasn’t all about the pineapples. I also had to find out all kinds of other details of everyday Georgian life so that I could create a believable world for the story. The opening scene is a grand dinner party, so I had to make sure that the foods and drink and table settings I describe would all have been around in 1761. Luckily there are some fascinating books and websites on this topic. I leaned that French cuisine was all the rage (hence the French chef and the boeuf a la mode) and so was fancy sugarwork. 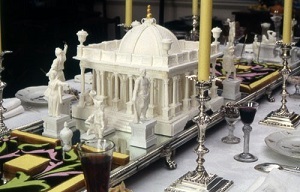 The sugarpaste Taj Mahal (the one that Mrs Fitchett faints into) is exactly the kind of centrepiece that might have graced a high society Georgian banquet table. As well as creating an authentic backdrop for the story, I discovered that there is another even more important motivation for a historical mystery-writer to do painstaking research about the time period of their story; it’s critical to plotting the crime and setting the clues. You can’t, for example, have a suspect drop a cigarette end or chewing gum wrapper at the scene of the crime when cigarettes and gum hadn’t even been invented yet (at least in the UK). A snuffbox would be just the thing though! I had so much fun finding out about eighteenth century fashion in the interest of getting my clues right that I thought I’d share three of my favourite details with you. This research involved several trips to the wonderful Victoria and Albert Museum (V&A) in London. If you can’t get there in person, they also have one of the best websites in the history of websites – just make sure you have plenty of time free when you log on as you could be there for days! Someone in my story (I won’t tell you who, so as not to give the game away) conceals a fairly large object about their person. 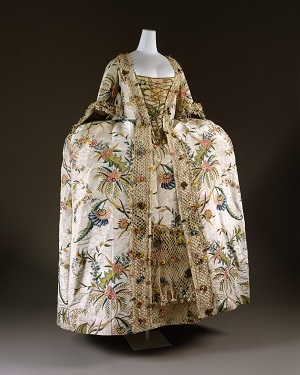 That might seem a bit unrealistic in these days of skinny jeans and crop-tops, but luckily for me, in 1761 the fashion was for huge voluminous skirts – which were often worn over padded frames called panniers. You could hide a week’s shopping in there! In fact, in turns out, ladies often did more or less that! And they had the pockets to put all the swag in too. Pockets weren’t sewn into the clothes as they are today; they were detachable ‘pouches’ tied on with ribbons, hidden between the layers of skirt, underskirt and petticoat. (If you’ve ever heard the nursery rhyme Lucy Locket Lost her Pocket, and have wondered – as I did- how Lucy managed to lose a pocket – now you know). 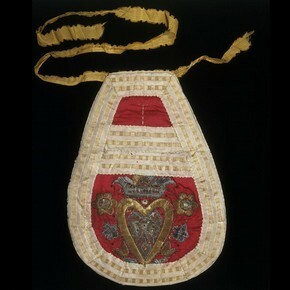 There’s a whole page on pockets on the V&A website with lots of lovely descriptions of the contents ladies would stuff into them, including snuffboxes, smelling salts, pincushions, money, combs, nutmeg graters, handkerchiefs, and even snacks. See here. There are also instructions for sewing your own eighteenth century style pocket. If my story had been set some forty or fifty years later, in the Regency period, my plot would have been scuppered; big skirts were passé by this time. Flowing, simple dresses (think Jane Austen heroines) were now in fashion. A bulky pocket would have ruined the look. Ladies began to carry small handbags called reticules – as people complained at the time, you could hardly fit a thing into them . . . and definitely not the thing in my story! Another important clue in Pineapple Plot concerns a locket containing a miniature portrait. People do still wear lockets these days, of course, but they’re much less common than they were in the eighteenth century. At that time a locket might have been worn as part of a bracelet or belt, as well as on a necklace. These days we can carry photos of our loved ones around on our phone. In 1761, a miniature portrait in a locket – usually painted on ivory – would have been played the same role – a keepsake of a family member or sweetheart. The best miniature painters, such as Richard Cosway, were highly sought after – a bit like celebrity photographers today. 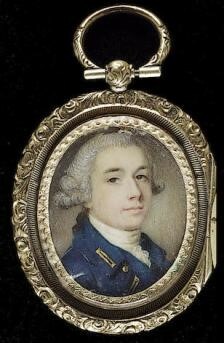 You can read a fascinating history of miniature portraits on the V&A website. 18th century portrait miniature with pinchbeck locket frame with engraved border. Bonhams. Lockets could also contain a lock of hair (sadly this was commonly a memento of a loved one who had died). 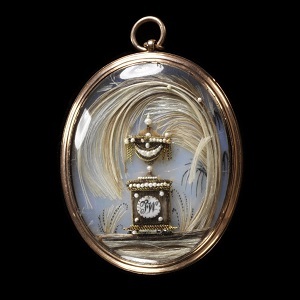 Often the locket would have a glass front so that the hair could be seen inside. Sometimes the hair would be artistically arranged to form a design, or even part of picture – something I think we find a little creepy now. English, High Relief Urn, c.1775; Photograph from Art of Mourning Website. Yes, that willow tree is made out of hair. In my story the lock of hair in the locket is not on display but hidden away – for a very good reason . . . I’d better not say any more. Another important clue in Pineapple Plot concerns poor Lord Ponsonby and his wig. I wanted to show Ponsonby as a rather vain and pompous man, and an elaborate wig was very much part of that image. It was fashionable for both men and women to wear powdered wigs throughout the eighteenth century. You’ve probably seen pictures of Marie Antionette and other society ladies wearing enormous wigs complete with ships and birds’ nests and other assorted objects (although these were often not strictly wigs, but huge wire frames, around which the person’s own hair, plus lots of extensions, were woven in what was called a pouf). 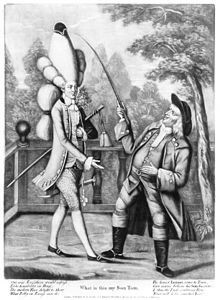 The height of fashion for very tall wigs (excuse the pun) was in the 1770’s and 1780’s, so just a little later than my setting of 1761. This was the case for men as well as women, particularly for the wealthy, fashionable set, often referred to as the Macaroni Club (because they had been on foreign travels and eaten exotic foods like macaroni). These guys – the hipsters of their day – were known for wearing flashy clothes and over-the-top wigs. Not surprisingly, cartoonists couldn’t resist making fun of them. In 1761, Ponsonby probably wouldn’t have had a wig quite this outrageous (but he’d be rushing out to buy one a few years later) but he would certainly have worn a sizeable white-powdered wig of some sort. Exactly what happens to it in The Mystery of the Pineapple Plot I will leave you to find out! In the meantime, I have one last page on the V&A website to recommend to you. 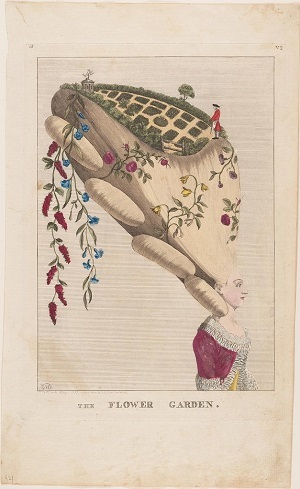 This one is an interactive game where you can design your own wild eighteenth century wigs. It’s hilarious, but be warned – it’s really addictive! Find it here. Thank you for giving me this chance to share some of my favourite bits of research and I hope you’ll enjoy spotting all these clues in The Mystery of the Pineapple Plot. With thanks to Helen Moss. You can buy a copy of Mystery and Mayhem here. For age 8+ years.